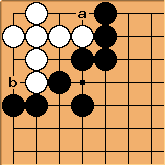 The Japanese go term, adopted into English, miai denotes that there are two different options such that, if one player takes one, the other player can take the other. Also, it typically does not matter which player gets which option, but sometimes each player has only one of the options. For example, in this diagram White lives because if Black plays at a, White plays at b; and if Black plays at b, White plays at a, in both cases making two eyes. We say that a and b are miai for two eyes. In general any such situation where when one player takes or prevents one of two options, the opponent will play the other, is called miai. If Black plays , White plays , for a net local score of zero. 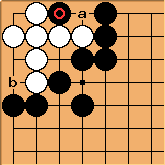 Or White may play and Black , also for a local score of zero. We expect one player to get one play, the other player to get the other, for a net local score of zero. The plays are miai. Miai applies to local positions like the above, but also in more general, strategic concepts. In English we often use the word equivalence to translate the concept of miai, in the sense that the two options allow the same objective to be achieved more or less. For example, miai in a life and death context might mean the existence of two different moves resulting in the equivalent outcome of living or killing. On the other hand, in the endgame context, a miai position has two points that are about the same point value, although these two values need not be exactly the same. However, most go players will simply adopt the word miai instead of the longer constructions in English. The term has more general use, as its literal meaning is just "looking at each other". In baseball, for example, an easy pop fly that could have been caught by any of two (or more) fielders might drop if the players thought the other would be going to catch it. This situation is also referred to as "miai" or "omiai", or they just "looked at each other". When two babies are curiously staring each other, the parents would say "they are looking at each other! ", or "miatteru". Arranged marriage is more often referred to as "omiai" but it can be just "mial". Usually, it is better not to play out miai points without additional reason. But playing it in the middle game is a loss of a ko threat which might prove to be decisive for the outcome of the game. As an example, consider again this miai position. Black can use either a or b as a ko threat to which White will reply with the other move. In this position we have added the marked stone. 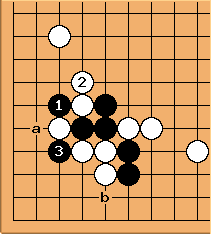 a and b are still miai for the life of this group, but a is 1 point bigger than b. Usually Black will leave this position alone to keep the ko threat, but when the game reaches the late endgame, Black will play the bigger move at a in sente.